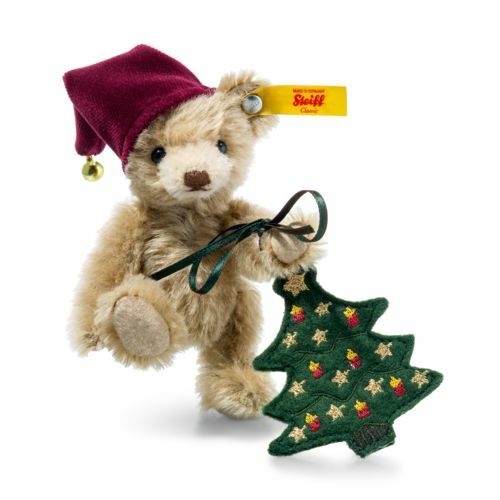 The sweet Nic Teddy bear with Christmas tree stands at an adorable 11 cm, making him the perfect Christmas gift. Nic is wearing a sewn-on hat with tiny bells. His little Teddy bear arm also has a cute fir tree attached to it featuring a star and candle pattern. The fir tree can be removed and makes a wonderful decoration for the Christmas tree. Nic Teddy bear is made of very fine mohair and is the perfect gift for any fan of Steiff.